Ways to Give - Triangle, Inc.
For 47 years we’ve been walking together towards a brighter future. Welcome to Triangle, Inc.! Monetary donations to Triangle, Inc. can be made in a number of ways and all amounts are deeply appreciated. After your donation has been received, you will receive a tax acknowledgment letter via mail or email. Online: If you prefer to donate online with a credit card, you can do so by clicking here. You can make either a one-time or a monthly donation online, and your credit card information will remain secure. If you would like to donate in memory or in honor of someone, please click here. Donor advised funds: A donor advised fund (DAF) is a type of giving program that allows you to simplify your charitable giving to Triangle, Inc. 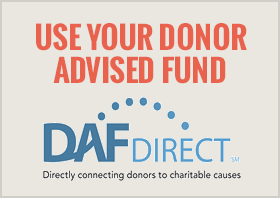 If your DAF is with Fidelity Charitable, Schwab Charitable, or BNY Mellon, click here to recommend a gift to Triangle, Inc. using DAF Direct. Simply enter your donation amount, and click next to complete your recommendation. If your DAF is with Vanguard Charitable, please use their website to recommend a gift to Triangle, Inc.
Amazon Smile: When you use Amazon Smile to purchase items, Amazon donates 0.5% of your total directly to Triangle, Inc. There are no additional costs to purchase items on Smile, and you will be linked to your usual Amazon account. You can shop as you normally would; however, to purchase items through Amazon Smile, you must use the link smile.amazon.com to place your orders. Everything else will look the same, but the URL must read smile.amazon.com for the donation to be made. To make Triangle, Inc. your preferred charity on Amazon Smile, click here. Triangle, Inc. will remain linked to your Amazon Smile account unless you make changes. Coin Up is a giving platform that benefits nonprofits throughout the world. After downloading the app and choosing Triangle, Inc. as your charity, link Coin Up to the accounts that you use to make everyday purchases. Coin Up rounds up all of your purchase totals to the nearest dollar and donates that change to Triangle, Inc. If you select a monthly cap, the donations will automatically stop when you reach your maximum. Triangle, Inc. always welcomes in-kind donations. All donors will be acknowledged and will receive a thank you note in the mail with our tax ID number. Auction Items: We hold at least two fundraising events each which feature silent auctions that raises vital funds. We will accept donations for this purpose at any time; items could include: restaurant gift cards, tickets, shopping gift cards, home goods, jewelry, and more.